Scattered snow showers will continue to fall over our northern counties for much of the afternoon. Snow chances increase this evening for the Lafayette area. Moderate to heavy snow is falling over northern Indiana and southern Michigan this midday. We have been tracking the winter storm through the morning hours, even though the weather has remained quiet for the Greater Lafayette area. Heavy bands of snow developed over Newton, Jasper and Pulaski counties at times this morning. Scattered snow showers will continue to fall over our northern counties for much of the afternoon. Snow chances increase this evening for the Lafayette area. Highs will reach the lower 40s. Another wave of light snow showers will travel over the area tonight with most of the snow falling north of Tippecanoe County. By tomorrow morning, Lafayette may receive about an inch of snow. Parts of White, Cass, Benton, and Miami counties may see 1” to 3”. More than 3" will be possible within Jasper, Newton, Pulaski and Fulton counties. 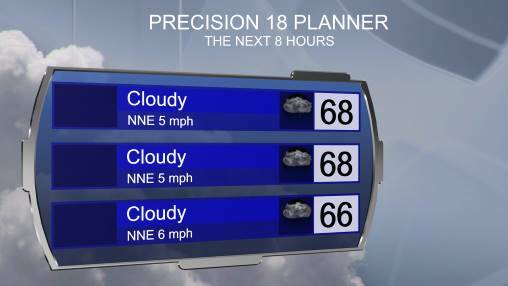 Skies will be cloudy on Saturday with temperatures rising near 30° during the afternoon. Models are not picking up on much precipitation during the day, but areas of freezing drizzle will be possible with lingering moisture over the area. It is difficult to forecast freezing drizzle because it is not always detected on radar. Just know that the drizzle may create slick surfaces during the day. There is concern with the wave of snow/ wintry mix that will move over the area Saturday night. Around midnight EST, snow showers will move into our western counties with the precipitation becoming widespread over area around 4 a.m. EST. 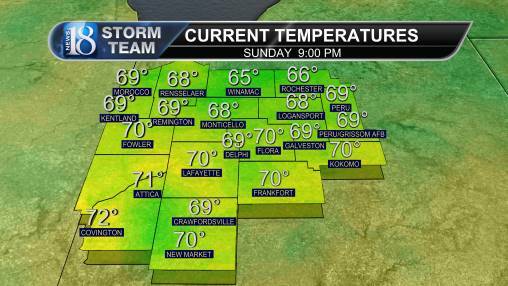 The pictures below are from our Precisioncast for Saturday night and Sunday morning. Notice Lafayette is right along the line for ice (pink) vs. snow (blue). Areas near the rain-snow line will result in lower snow totals. Our northern counties will have a better chance for seeing accumulating snowfall. An additional 1" to 3" of snow is going to be possible north of the Lafayette area. Lafayette will be on the lower end for snow accumulation. Our southern counties will likely see freezing rain/drizzle which may create a thin glaze of ice (trace) on surfaces. Even small amounts of ice will potentially cause hazardous road conditions. The wintry mix will move out that afternoon and quiet weather will return early next week.